Montgomery BART Quartet: At the Montgomery BART (Bay Area Rapid Transit) Station, 9am. 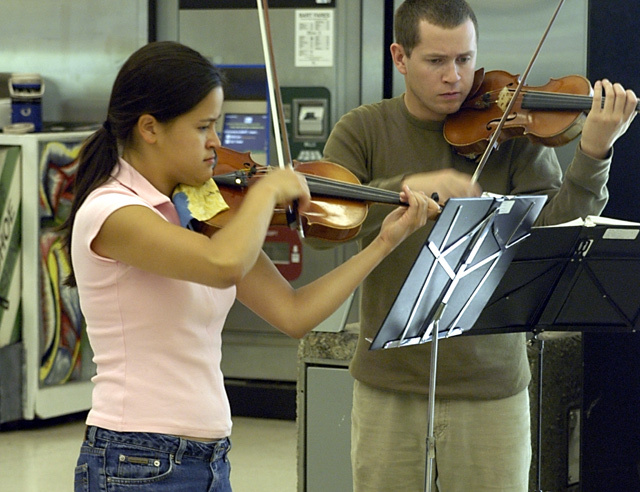 This is my group favorite among the train station regular musicians. They really sound great. There are actually four of them (hence "quartet" in the title), a cello and viola not pictured here; they always set up in front of this big lighted "Mamma Mia!" billboard that ruins photos of the whole group.